These convenient return address labels definitely make the cut! The eye-catching, checkered design is an excellent way to top off your outgoing mail. But what truly makes this product a gem is how much time you'll save when you use it. Forget about the hassle of writing out your return address by hand over and over again. Since these are self-adhesive labels, a typically time-consuming job because extra easy! Just stick a label on every envelope before it goes in the mailbox! 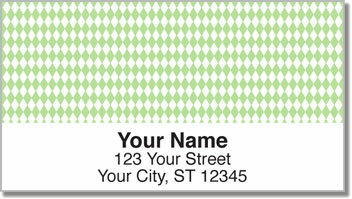 Order your very own Green Diamond Address Labels right now! There are three other color choices available. Plus, don't forget to get some matching personal checks to make it all complete.